Over the summer, Chicago Alderman Gilbert Villegas drew the ire of animal activists by proposing an ordinance that would sanction pigeon racing in Chicago. As outlandish as that may sound to some people, it is a popular sport in some parts of Europe, particularly in Poland, enjoyed by both trainers and spectators. The racing is based on the homing skills that these birds possess. Whether racing or not, pigeons seem to stir up controversy among urbanites and this proposed ordinance was no exception. My initial reaction was to think about how my view on pigeons has evolved through the years. When I moved to Chicago back in the 1970s, my first “encounters” with pigeons were memorable. While walking under the elevated train, I was “pigeon bombed.” My business suit needed an immediate trip to the cleaners. After this, I began to be more watchful, not because I cared for pigeons but because I cared about what they might do to me. Once I was aware of their presence, pigeons seemed to be everywhere, waiting to strike. I often attend baseball games, and I noticed Old Comiskey Park seemed to have as many feathered fans as humans. I learned that I should not sit down in the upper deck without peering upward to see what was perched above. Over the years, I became a jogger, running 3-4 miles five times a week. I found that running relaxed me and opened my mind to my surroundings. My enjoyment of these runs, I realized, was based on more than a runner’s high. My pleasure was also derived from the places, such as the lakefront or Lincoln Park, in which I was taking these morning jaunts. The connection to nature was the hook that kept me coming back. This soon impacted my day job as an accountant, and I naturally gravitated toward doing work for conservation organizations, such as Openlands, and later, the Center for Humans and Nature. Although I was in a support position, helping with the financials, I felt strongly drawn to the causes for which these organizations work. I came to view nature from a perspective of coexistence. 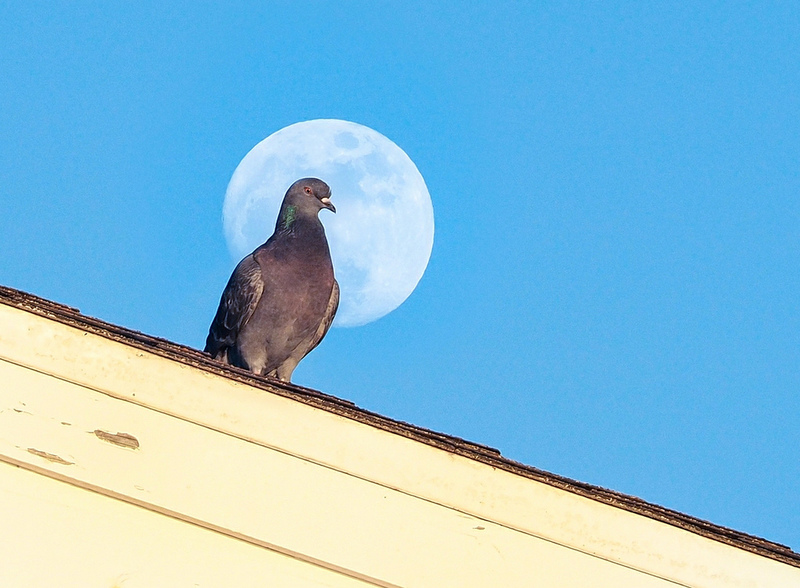 With this new lens, I decided to do some pigeon research. 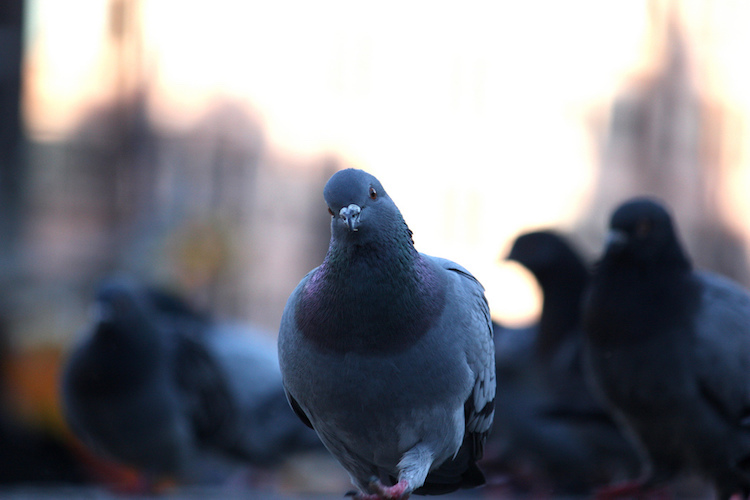 Pigeons appear to be brazen and aloof as they coexist with humans in urban centers such as the Chicago Loop. Yet why shouldn’t they be coolly comfortable with their surroundings? Their associations with humans can be traced back to at least 3000 BCE, when they were originally domesticated to serve as an important food source in the Middle East. Later, they escaped or were let loose by humans to fend for themselves. They do face some dangers. These feral birds are not native to North America, and as a result of this foreign status, they must survive without the protection of the Migratory Bird Treaty Act. So pigeons not only have to contend with natural predators such as peregrine falcons but also lethal and birth controls imposed by humans. 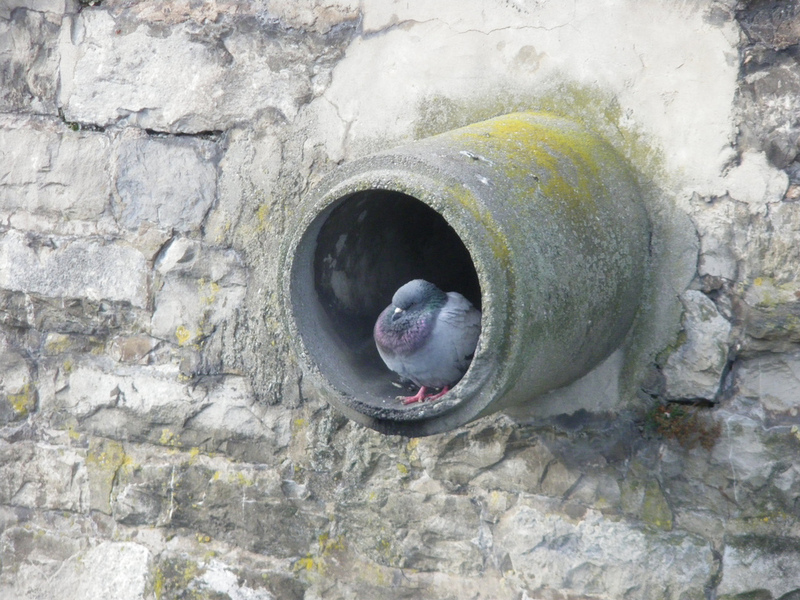 Pigeons are comfortable in urban environments because buildings offer places they can roost that are comparable to their native cliffside habitats. For most birds, buildings are deadly obstacles; in contrast, pigeons consider these same edifices to be home sweet home. Their singular navigational skills play well in the dense urban jungle. Of course, the most important piece of the survival puzzle is food, and urban life offers easy pickings for pigeons; their keen cognitive and visual attributes make for efficient foraging in the city. As I continued my research, I was bombarded with information that increased my respect for this urban adapter. Pigeons have been subject to numerable scientific studies that go beyond their known homing skills and indicate they have intelligence worthy of continued testing. I was particularly impressed with research that demonstrates their social skills among people and other pigeons. Their tendency to associate with humans provides them with an easy food source, and their monogamous, protective, peaceful, and intelligent qualities all make them good candidates for domestication. None other than Charles Darwin had a fervid fascination for his flock of pet pigeons. As I compiled and reviewed my findings, I felt a need to further understand my own keen interest in this bird. How did my newly acquired knowledge connect to my personal experience of pigeons? One more Google search and I had an epiphany: an image of Joseph Zeman (the so-called “pigeon man” of Chicago), a picture that conjured many memories. I did not personally know Joseph Zeman, but during the 1980s I had contact with him several times every week. I lived at the LaSalle Towers, less than a block from Joe’s Newsstand at the southeast corner of Division and LaSalle on Chicago’s Near North Side, and that was the place I went to buy my newspaper. Buying a newspaper from Joe was not something I relished. This middle-age man of short but solid stature typically wore a bewildered look of disdain. He had the appearance of a person that was emotionally spent. Any communication from him came abruptly in sharp words that sounded like barking. I also made sure to have exact change for my paper since the slightest deviation in his routine could set him off. Even more intimidating was the large number of pigeons he attracted. Buying a newspaper felt like stepping into a scene from Hitchcock’s movie The Birds. At first, I was afraid of the pigeons themselves, but soon I became more concerned about disturbing the pigeons, which in turn would upset Joe. Although the pigeons covered the newsstand and Joe, he always had a clean appearance, lacking any scatological evidence of getting too close to his feathered friends. I noticed my papers also had no evidence of being “perused” by the birds. What was the mutual attraction between Joe and the pigeons? Unfortunately, I did not learn the answer to that question until I read Joe’s obituary in 2007. I found out from the notice that Joe’s life was hard beyond belief. His known challenges included epilepsy, dyslexia, ADD, and hyperactivity. His formal education consisted of a two-year stint at the ages of 15 and 16 in a state mental hospital. He lacked any family support. Despite this background, he had a very good work record at a variety of jobs and was very dependable. According to the obituary, being such a good worker opened the door to his getting a loan to build his newsstand. 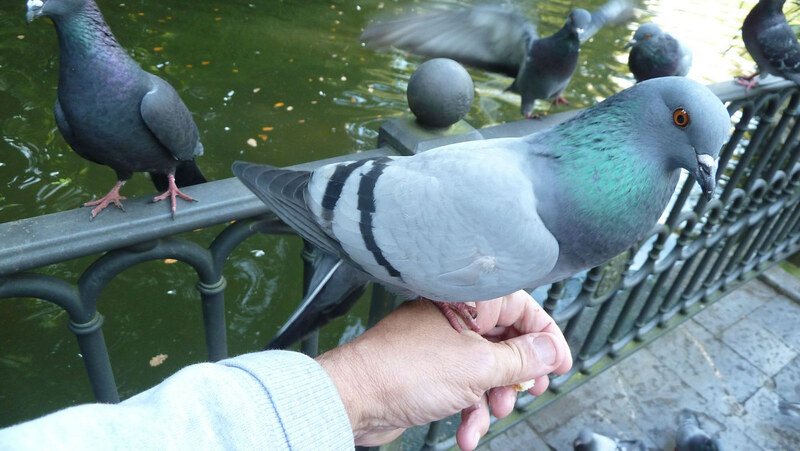 Joe’s closeness to pigeons was not an instant friendship. During his early days running the newsstand, he gained their trust one by one. Over time, he nurtured and cared for these animals. He talked to them and called his favorites by name. From what I could discern, and as shown by his calm demeanor, Joe finally found the friendship that was so lacking in his contact with people. When Joe retired, he continued his friendship with pigeons near his home in Lincoln Square, a neighborhood located in north Chicago. Joe’s relationship with pigeons—and my personal interactions with Joe—taught me something that my research couldn’t. In addition to the various ways pigeons can be valued, their role as therapists is worth further consideration, especially their potential as companions to those who may have few people to lean on. For some, pigeons make a city a less lovely place. Joe showed me that the city is a shared space, and the companionship of nonhumans may be just as important as the companionship of humans. 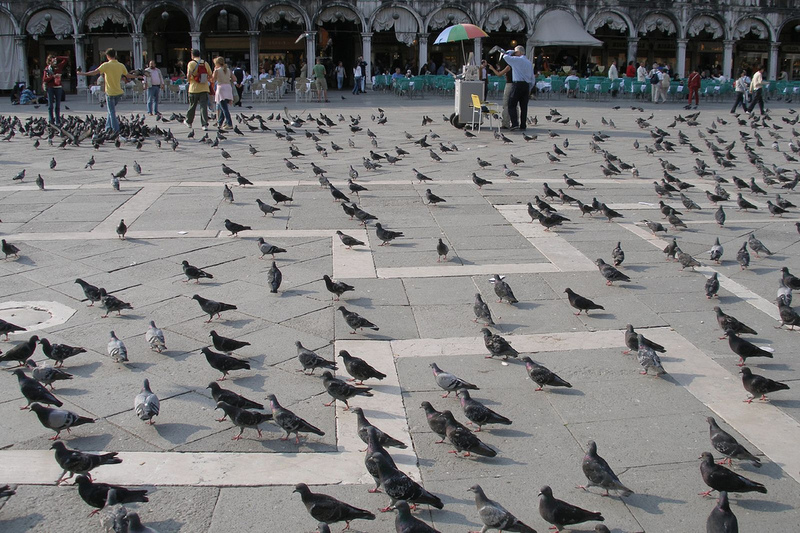 Many cities must address the challenges of human coexistence with pigeons. My wish is that solutions will be informed by consideration of the positive attributes of these birds and the willingness to learn more about them. We can only hope to learn as much as Joe did. 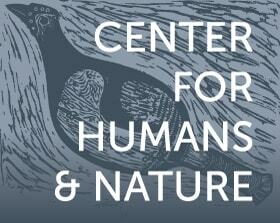 Jon Daniels is Controller of Center for Humans and Nature and several other nonprofit organizations. He is a certified public accountant with over thirty years experience. Jon is active member of the Society for American Baseball Research and a lifelong St. Louis Cardinals fan. He attends over seventy-five games each year. Jon is also the co-host of the weekly posdcast the Bro Show.